The study, entitled "Structural basis for blue-green light harvesting and energy dissipation in diatoms," is published in Science on February 8, 2019. The FCP membrane-protein was purified as a homodimer from P. tricornutum and crystallized. The structure was solved by X-ray diffraction at a resolution of 1.8 angstrom, which showed that each FCP monomer contains seven Chls a, two Chls c, seven Fxs, one diadinoxanthin (Ddx), two calcium cations and several lipid molecules. 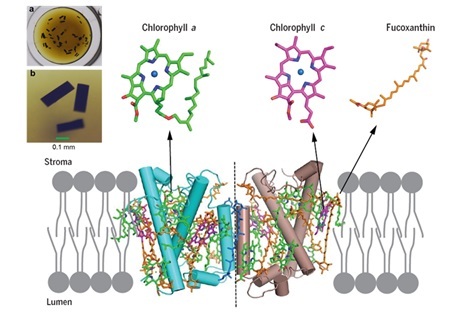 "The network of specific pigments demonstrated by the first and high-resolution FCP structure reveals a solid basis for blue-green light harvesting and super photochemical quenching in diatoms," said Prof. SHEN Jianren, a corresponding author of this study.